Elke stocking up on gear for Drawing Booth. I was scrolling around on Instagram, dropping likes, comments and (at least) partially (I hope) intelligible emoji combos when one particular photo jumped out at me. I’d seen ‘glamor shots’ of Minaal gear in epic locations, posed with fancy watches, laid out under designer sunglasses, propped against fast cars, used as pet beds(!? Come on… What’s more glamorous than a cat bed) and casually arrayed in first-class seats before, but this was next level. It was a Daily brimming with brand new iPads Pros and Apple Pencils! A few clicks and a DM later, I met Elke. 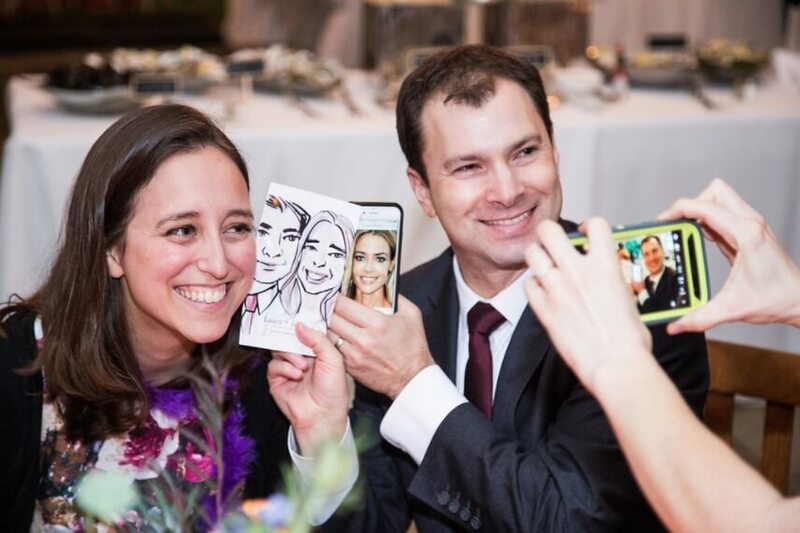 She’s an artist who’s using ‘fun tech toys’ with her growing team of illustrators to travel and “live-draw” instantly-shareable portraits at events and parties across the globe. 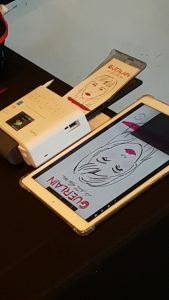 What is Drawing Booth and how did you get started? It is like a photo booth, but with real artists who mingle with you while you enjoy the party. Drawing Booth came out of my passion for quick drawing, a personal obsession with fun tech toys, and a love for bringing people together. 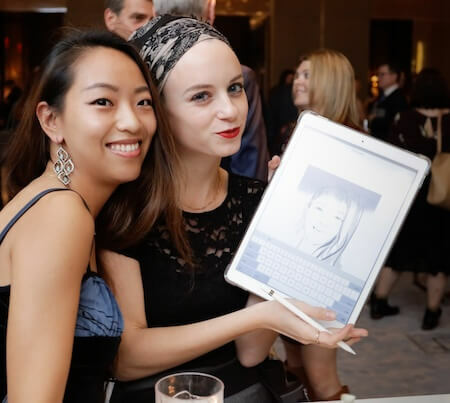 Our first event was for the Webutante Ball in 2014, a party for the personalities of Internet Week in NYC. The technology for drawing on an iPad was not as advanced as it is now, but it worked for my quick expressive style. I knew right away that I wanted to have teams of artists. It took a while to find and teach others how to do what came naturally to me, but since then we have grown to having teams based out of 3 other cities! 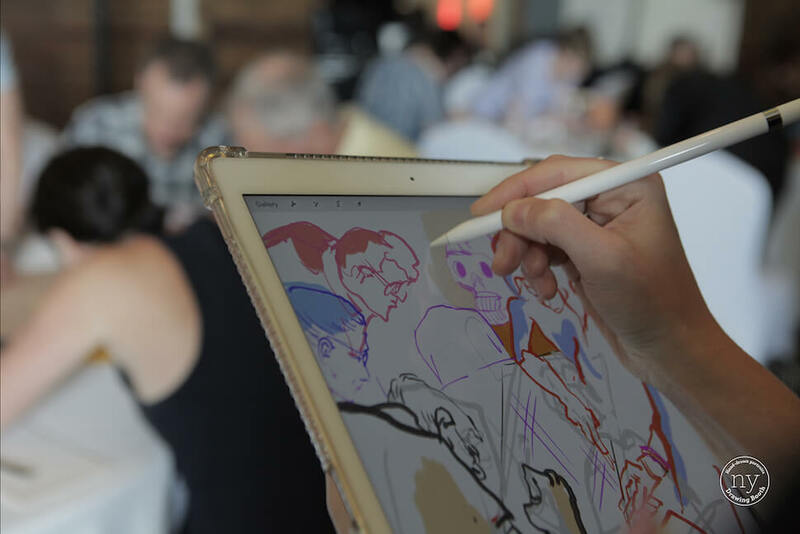 Drawing Booth now has teams in New York, Los Angeles, Chicago and London. It seems like you’ve been on the road a lot lately. Did you start all of these new teams in different cities just as an excuse to travel? Be honest! When clients started asking to fly us out for events, sometimes to more exotic locations, it seemed to make more sense to allocate those resources to creating teams that supported local artists instead. Each city should take pride that they are providing jobs that support their own citizens. What’s your background as an artist and what kind of projects interest you? I studied illustration at Pratt Institute and always had a fine-art attitude towards my illustration. My digital technique comes straight from how I worked for years in brush and ink as well as drawing in Photoshop using a Wacom tablet. What I love about working on an iPad is that it allows me to work on the spot without having to fumble with materials. It also gives me a hard (digital) copy to see what I’ve done and how I’ve progressed. When working on paper, once you give the artwork away, it is gone forever. 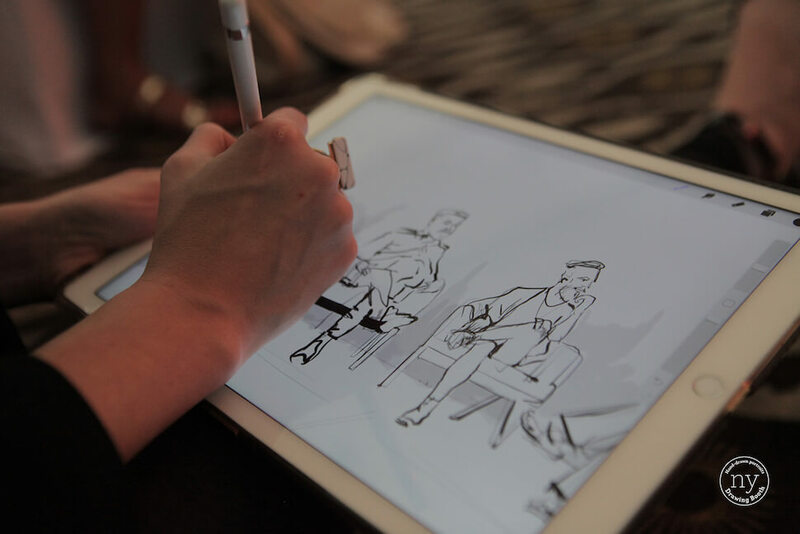 Live drawing at an Interior Design Magazine event in Cancun, Mexico. What’s your favorite destination that you’ve visited (with Drawing Booth or otherwise) and why? Florence. As an artist, it was like coming home. Pack light and have the boarding pass screenshot saved to your phone. If you travel wearing minimal professional attire, ie. a blazer, half-decent makeup, and dress shoes, people will treat you much nicer on your flight. You’ve said travel gear is “another obsession” of yours. What do you love about it and how would you describe your travel style? My travel style is minimal and ultra-light with a professional twist. It’s having EDC that is tech useful but also looks like fine jewelry. 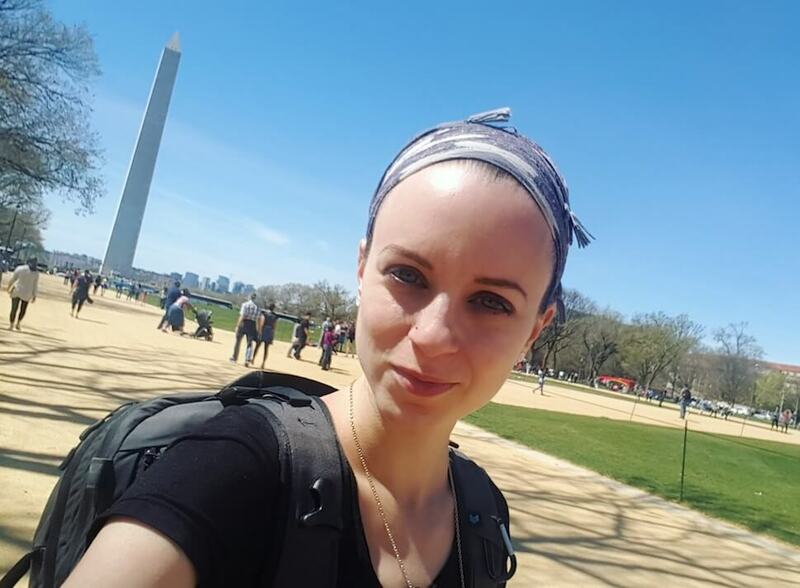 Elke at the National Mall in Washington D.C. with her Carry-on 2.0. I love having the tools to do things, make things, and being prepared for any situation so I can just be thrown anywhere and am prepared for whatever comes at me. It is always a challenge between packing light and that prepared-for-everything lifestyle, or when your expectations are turned upside down and you need to make a quick decision, to turn back, or make the best of the situation. What I pack keeps me prepared for high business or a hop in a kayak. I grew up in New England where forests and boats call to me even as a city dweller. My rule is that an overhead bin is only used for transporting my event equipment (which includes a backup of everything just in case!) and my personal luggage sits at my feet in the seat in front of me. Where are you planning to go next, for work or for fun? 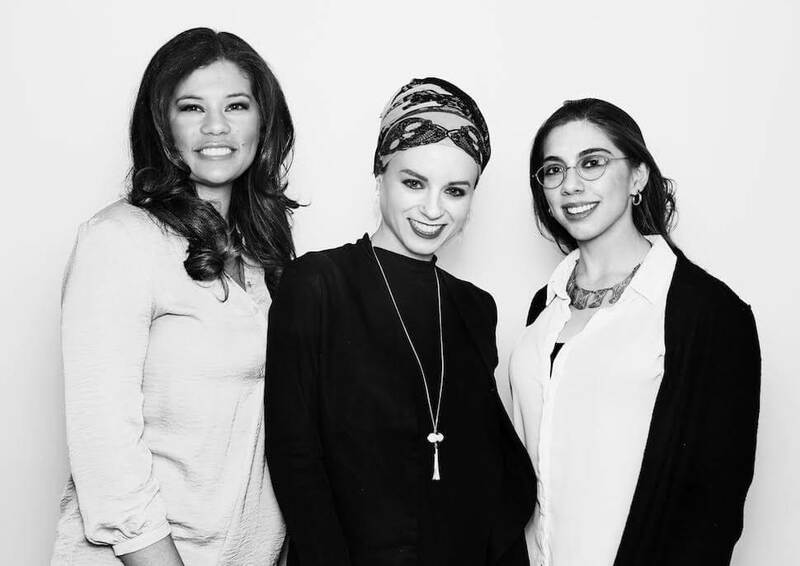 I’ve been traveling back and forth between NYC (my home base) and LA and Chicago, to train artists for our new expansions and to show off our services to potential clients. For fun, I want to do a multi-destination trip around Asia, ie. India, SE Asia, China, Japan. Recommendations and personal invitations are welcome :). You said you were growing “frustrated by a career in art that involved less and less actual art-making” and that you started Drawing Booth as an outlet to draw as much as possible. Can you talk about why you made that decision? When I started fresh out of art school, I used to draw all the time, at figure drawing sessions, on the train, an illustration a day was my motto, but in 2010 I launched myself as a painter with my breakthrough series Hipsters & Hassids. My career became less about producing work and more about exhibiting it. While that led to more attention, I missed the act of drawing itself. When we draw for events, we get to draw for hours! It’s like attending a figure drawing class except we get paid to do it! Showing the results of his portrait. Drawing and getting in “flow” is very meditative. It is essential for artists’ well-being to draw enough. When you draw from life it isn’t about overthinking a process. You become the conduit for what is before you, to express itself. You also connect with the world around you in a visceral way by looking deeply and emphasizing with your subjects. As much as we are using giant touch-screens, it is actually a way of connecting and getting out of our studios and into the real world with real people and having real moments with them. In the process, we become exposed to so many different industries and learn their value and how all these elements play a role in our society. Who are your clients and what kinds of events are the most fun/interesting for you? 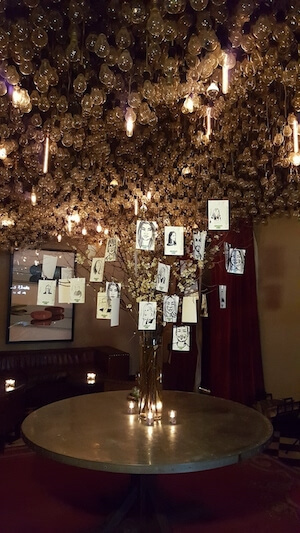 We do all kinds of events primarily for the corporate meetings and events world as well as some weddings and mitzvahs – company parties for their employees or clients, basically anyone they want to impress. Guests having pictures taken with their portraits. Our clients range widely, entertainment companies, movies, beverage or footwear who want to show off their brand, a medical society who wants something fun, a major toy brand who wants us to draw people to look like their toys. Drawing Booth portraits on display. Launches are a big one, they get people excited about a new product and fun takeaways to remind them of their experience. We will even draw people with that product. Our inbox goes crazy around the holiday season when every company wants to have fun things for their holiday party. We love it! The most fun/interesting are fun creative companies who appreciate how much more we can do than just the straight portrait. 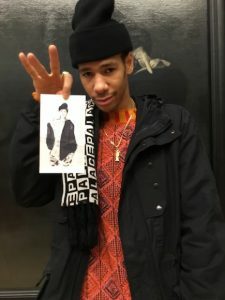 Whether it’s mimicking the aesthetic of a fashion brand or a design magazine who want us to interpret their event for them, they allow us to be artists, designers, and creative thinkers and improvise on the spot. We have a lot of talent behind us and enjoy the chance to show it off. We have tried several avenues for finding the right talent but it has honestly been Craigslist that casts the widest net! We look for artists who are eager to push themselves creatively, socially, and with professionalism to achieve the high-quality product that we provide. When looking for artists, it’s not necessarily their portfolio that speaks to us. We look for artists who can manage our unique combination of talents. It is about 50% drawing and multitasking with the tech and 50% about working with people, both as a team and with the clients. We work to bring joy to people at events and artists have an amazing opportunity to build that type of positivity in addition to creative interpretation. 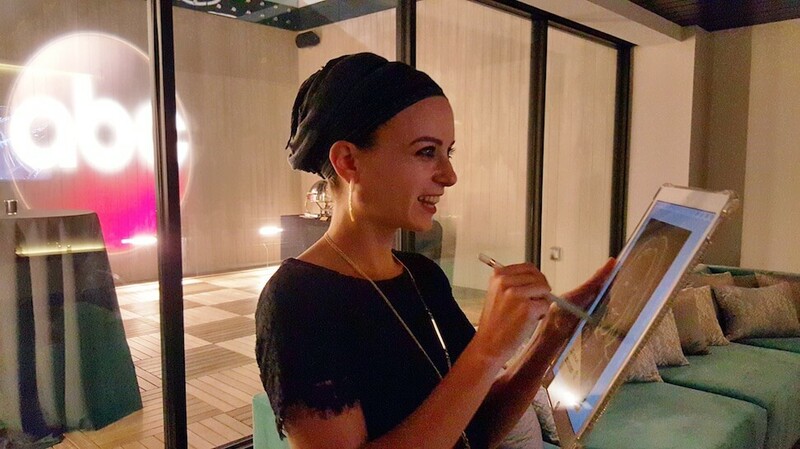 The artist mingling and drawing live at an Interior Design Magazine event in Cancun. Painting/drawing can be a solitary pursuit, do you enjoy the performative aspect of creating something with a subject in public? Has working live been a stretch for you or was it something you were always comfortable with? What’s challenging or great about that? As a self-aware extrovert, I love drawing for people. It creates an exciting challenge to focus and impress but I also feed off of the crowd’s support and excitement for seeing something come to life from out of nowhere. Elke sharing a portrait with guests at a black tie event. As an artist, I care about the artistic integrity of what we are doing and constantly ask myself if drawing a similar type of portrait for so many people, very quickly, over and over and over again, holds up creative value. Then I remind myself how every face is a new challenge, a unique opportunity to perfect one more aspect of portraiture, one more detail that can help me and my team become master artists by keeping up our skills. What is great about this as a profession is that there are always opportunities to hone artistic and technological technique that provide greater impact, even while confining what we do to such a limited time-frame. It teaches you a lot about what you can accomplish in 2 minutes. What’s the role of technology in what you’re doing? Is it mostly for convenience sake or does it enhance the artwork? When it comes to drawing, technology has always been to mimic real-life materials and how they organically affect the value, shape, line quality, texture, and tone of the work. For my company, technology means portability, speed, a wide selection of brushes in a single device, the ability to make instantaneous, minute adjustments, the sacred undo button, and then the use of pressure sensitivity, which has basically been the game changer of digital art. An artist illustrating a panel discussion as it happens. Tech enables us to take something that is as complicated as hand-produced art and allow it to match the vision we have in our heads. It removes roadblocks, like color mixing, or waiting for paint to dry. On the one hand, working on the iPad does cut out the physicality of our work, but on the other hand, it allows us to be truer to our intended vision – what we want out of the work. In a way, technology has helped us become masters of art instead of allowing the materials be master over us. From loose pigments ground from precious stones to ready-to-use tube paint, this ease has made the process faster so we can get straight to the art-making, but it also removes us from the roots and significance of the creative process. While I do miss paint, and getting lost in the creative process, drawing digitally allows me to focus more on capturing the true likeness of my subject, instead of my own need to create a “pretty picture”. What are the biggest advantages of drawing/painting digitally? It saves space and preserves resources, that is for sure. Tech helps you achieve the vision of the painting much quicker and allows you to make changes, but it prevents “happy accidents” from the unexpected mixing of materials and physics. There are calculated ways built into programs like the app we use, Procreate, help to integrate a bit of a mess and texture, to get away from an overly crisp digital aspect. Rough edges and lower opacity with a realistic dynamic range make all the difference in the world. 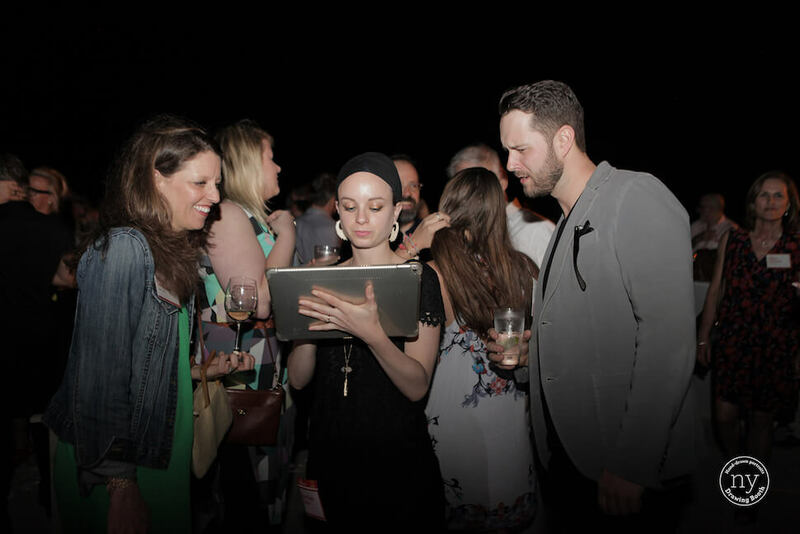 Elke working in Procreate at an event for ABC. Never running out of paper though, that’s probably the biggest advantage for me. You’ve added several cities to Drawing Booth already and have even ‘gone international’ by setting up a team of artists in London and taking other gigs abroad. Where do you see Drawing Booth going and what’s been your biggest challenge getting there so far? A Drawing Booth artist shows her clients their portraits. 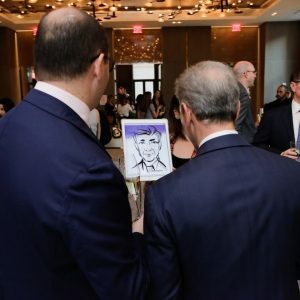 We were the first to establish this interactive digital live-drawing experience, and even though we are getting copycats, it is still a challenge explaining exactly what we do and how our product stands out compared to typical caricature artists, who just switched to drawing digitally. I see our next steps as venturing further into experiential marketing solutions for companies, continuing our mission of integrating creativity with real-life experience. Are you always on site with your team? Are there any challenges/joys of working with other artists? I’m at about half of our events and will be at fewer as we continue to expand. I love drawing but I’m not as available and that works out really well for our artists working on the reg! The challenge of working with other artists is for them to understand that the event itself is a small portion of all of the blood sweat and tears that goes into operating a business. 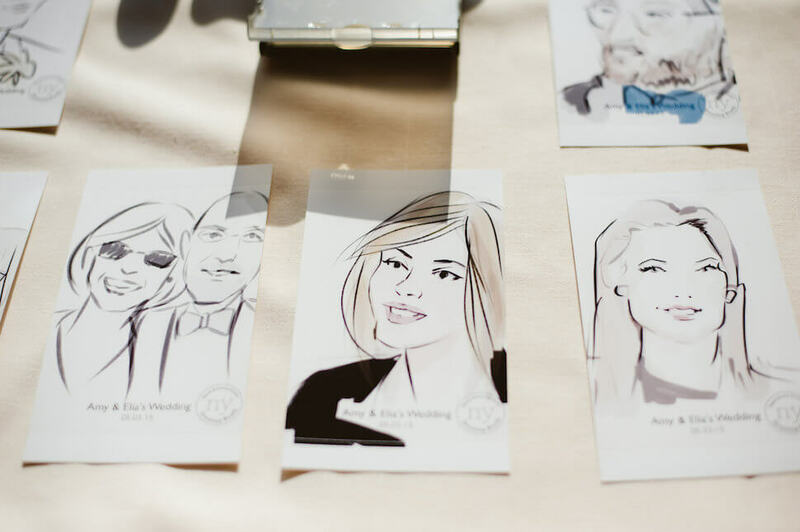 Wedding guests could have their portraits printed on site. Photo by Jacob B Murphy. The joy of working with other artists is being inspired by them since they have more time to work on their technique then I do, so I get to sneak in some quick inspiration and education after spending so much time on paperwork and admin! What do you need to take with you to an event? And how do you carry it? I will always be carrying my iPad, Apple Pencil, portable printers, batteries, chargers, extra ink and paper for the printer, business cards, essential EDC, and a snack. Depending on how I go I either use a rolling bag for gear (currently the G-RO packed with a little foam) or a combination of off-the ground solutions like my Minaal Daily and a cushioned gear briefcase. When traveling for events you will often find me with my Minaal Carry-on 2.0 on my back for personal carry and my G-RO rolling beside me doing the heavy lifting for my gear. Working live is always risky/challenging – have you ever had anything unexpected happen? How did you or your team handle it? I tend to be a more laid-back person, except when it comes to my business and our quality standards. What we do requires several simultaneous levels of performance, and for sure, focusing on one can put a strain on the others, but we work very hard to prepare our team for expecting the unexpected and managing those situations with professionalism. Thankfully there haven’t been too many problems. Technology fails happen but each new situation encourages us to be even more thorough on our systems and remind ourselves, no matter what, just keep drawing! What’s been your favorite experience so far? Can you share a moment that made you feel proud of yourself or your team? Drawing in Aruba. Nothing beats being flown out to Aruba (or the Bahamas, or Cancun) to do what I love the most. Even better is when doing it for people with expertise who appreciate it. I recently did live-drawings for Interior Design Magazine for their Giants of Design conference in Cancun (my room had its own pool!) but what was even better was drawing for these top architects and designers and seeing how impressed they were! Most proud of my team, I would say was recently when we had a big, big deal event for a confidential client with many complex technical needs and I was out on one of our new locations training our people there. Our team in NYC handled the event and all its challenges well without me. That was a moment of true pride. Elke and the Drawing Booth Admin Team. If someone is interested in becoming Drawing Booth Artist what’s the best way to connect? We have had a great experience with fine artists and illustrators who are good at realistic and stylized almost fashion portraits since we look to make every drawing flattering. These artists have their own established careers exhibiting, doing commissions, and honing their skills in figure drawing sessions. They care about the craftsmanship of their work but also are able to let go, do a quick drawing and move on. It can be difficult to find people who aren’t afraid to step out of their studios and work under such intense pressure, but very rewarding when we find the right talent up for the challenge. 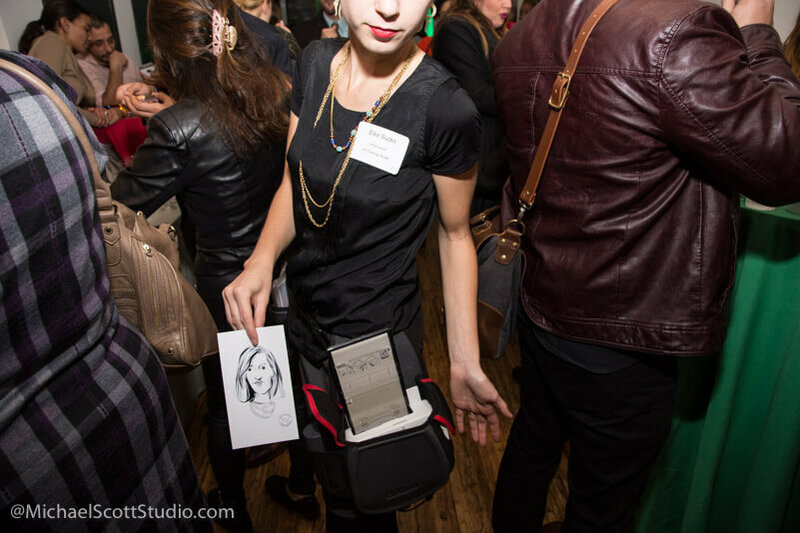 Flossin’ that mobile printing belt. What’s next for Drawing Booth and for you? With Chicago, LA, and London up and running, we are giving all sides of the business an upgrade and expanding our marketing presence to let people know we are the pioneers and we are available everywhere! Growing as a company also means doing a lot of unsexy business things like building a thorough admin team so I can focus on my vision and continue to innovate. We are excited about creating special projects like corporate collaborations and new offerings to show how much else we can really do. I turn 30 this year and am excited to usher in the next stage of my life. I’m working on being bi-coastal and looking forward to having a little more time to get back to personal art projects, zentrifying (#zentrifying) my work/life space, and to plan some epic traveling where I get to use all those points I’ve collected! Where can people find out about what you’re up to and about Drawing Booth? Follow us on Instagram @elkerevasudin and @drawingbooth. 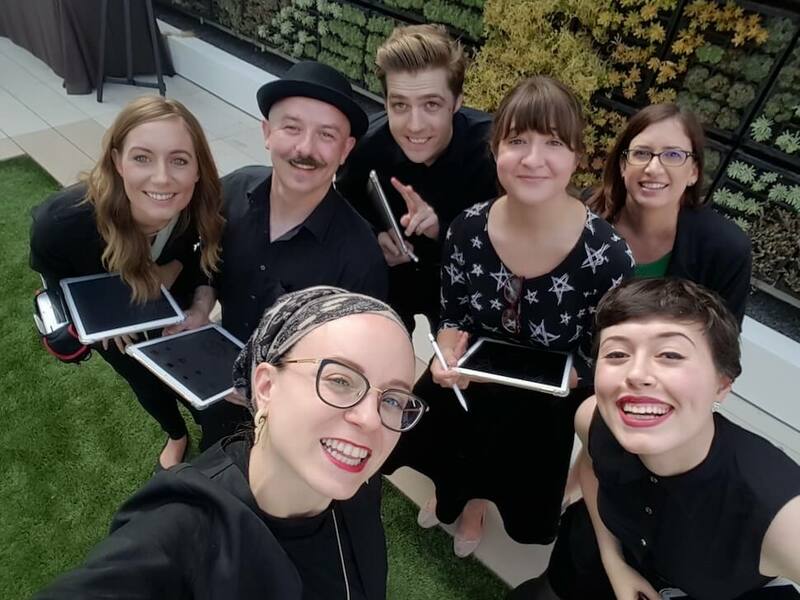 Elke and the Drawing Booth team at an even in Los Angeles.